When I was pondering what I wanted to do for this Chickpea Cauliflower Curry, one thing was for sure – I wanted to keep it SIMPLE! An acronym that I regularly use is K.I.S.S. What’s that you ask? Keep It Simple Stupid. Yes, yes. I say that to myself. And it’s often the answer you need (at least for me it is). Sometimes curry recipes can call for a lot of ingredients, but not this one. I wanted it basic, but I wanted it flavourful and hearty. The curry and tomato paste combo gives a big lift in the ol’ flavour department and the cauliflower florets and chickpeas gives the dish heft. It fills you up without weighing you down. Basically, fry the onion for a bit in coconut oil. Add tomato paste and curry paste to the party to waken them up. Chuck in the cauliflower and chickpeas stirring to coat in all that yummy flavour. Add stock, coconut milk and spices, stirring to combine. Bring to a medium simmer to reduce the sauce a tad. Add a cornstarch slurry to thicken a bit (without adding a ton of fat). Serve over rice and garnish to your little heart’s content! This recipe comes together quickly! It’s best to have all your ingredients prepped and ready to go in the pan. Use unsalted vegetable stock so you can have better control over the salt content in this dish. Full fat coconut milk works best here as it give the sauce a creamier, richer consistency. If you can find unsalted canned chickpeas, use them here (that’s what I used). Rinse and drain before using. A squeeze of fresh lemon juice is highly recommended here. It really brightens the dish! Hope you enjoy this Chickpea Cauliflower Curry as much as I do! This Chickpea Cauliflower Curry recipe is made in one pot and can be on the table in about 30 minutes! This one is delicious on its own or over rice. Don't forget naan to soak up all that rich sauce! In a medium sized pan (about 10 inch) over medium heat melt coconut oil. Add onion and cook until translucent, about 5 minutes. Add tomato paste and curry paste and stir to combine and cook 1 minute. Add cauliflower and chickpeas and stir to coat and combine. Add stock, coconut milk, cayenne, ginger, salt and pepper and stir to combine. Bring to medium simmer and cook 15 minutes uncovered until cauliflower has softened slightly and sauce reduced a tad. Mix cornstarch with cold water and stir. Pour into chickpea mixture, stirring to combine and cook for 2 minutes. Enjoy as is or serve over rice or quinoa. Garnish as desired. Enjoy! The perfect week day, meatless Monday meeal! Totally trying it asap since I haven’t cooked anything curry in ages! Happy to hear that! Hope you enjoy it, Melanie 🙂 Thanks so much! This looks delicious with the coconut milk and cauliflower combo, yum! I will have to try this soon! This is such a perfect looking dinner! I love the addition of tomato paste to the curry! Great idea! Thank you Marlee 🙂 It really does add a depth of flavour! I’m excited about the warmer temperatures too! How can one be in a bad mood with all this sunshine? 🙂 This curry looks amazing! I love a simple curry, it’s a great way to use up those leftover veggies. Totally!! Thanks so much Natanja 🙂 Have a wonderful weekend! I always refer to it 😉 Thanks so much Ben! Hope you enjoy it! I LOVE quick curry recipe – and this looks so fantastic! I haven’t used curry paste since my college years – when a friend mentioned getting my curry fix by just using caramelized onions, curry paste and tomato paste to make curry. It worked and saw me through those hungry college years! Thanks for sharing this, Dawn! Hoping you have a wonderful rest of the week and WEEKEND! We had nothing but rain last weekend here in London but are looking forward to a sunny bank holiday weekend, fingers crossed! Vegetarian curries are fantastic – I like the look of your chickpea cauliflower curry and I love the step by step instructions and pictures. Have a great weekend ahead, Dawn! Our plan was to pull out the deck furniture, but we never got around to it.. We ended up with rain and then we just ran out of time. It will have to happen next weekend. This curry looks great! Love how simple it is to pull together! Fingers crossed for nice weather 🙂 Thanks so much, Kathy! It really is super simple! I’m definitely making this for lunch this week! This sounds so hearty, delicious and healthy. Cauliflower is seriously the magic vegetable! I’ll have to swap in maybe cannellini beans for the chickpeas because Keith’s allergic (bummer, right? ), but otherwise am going to try this just as you’ve written it – yum! I know, right?? So yummy! Hope you guys enjoy this one!! Thanks Marissa! I’ve been eating a lot of cauliflower and chick peas lately, so I love that you combined them in one dish! Looks and sounds so flavorful Dawn! I always appreciate a tasty and filling veggie dish. Yay for sunshine and warmer weather! Hope you’re having an awesome week! Thanks very much, Leanne! I know, right? Hopefully, we’re in for a nice spring 🙂 Hope you’re having a wonderful week too! What a great recipe- it is always a good time for curry! We love it at our house. Thank you for keeping it simple, I am always on the search for easy recipes I can throw together for dinner, that are not out of the freezer or a box! I agree with ya there 🙂 Thanks Susie! Hope you get a chance to try this one out! Cauliflower is such a great under utilized vegetable!! 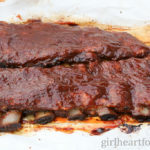 This recipe looks so flavorful and your pics are beautiful! Love quick recipes so adding this one on my menu for next week! We need to eat more meatless meals like this to lighten things up. Going to add it to my recipe rotation! Yum! A really recipe that is absolutely perfect for my meat free Mondays! I am in love with caulo at the moment but mostly I use it as a side dish. This curry looks like just the thing for me! 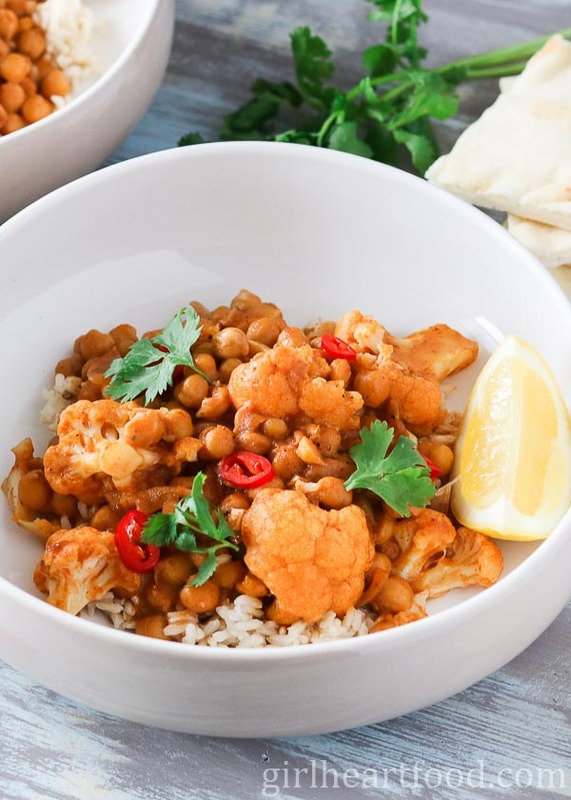 Cauliflower and chickpea are my favourite ingredients for a vegetarian curry, this sounds glorious, light but filling and packed full of flavour! Another way to enjoy curry in a healthy way.I like this recipe, very simple, easy, hearty and looks delicious! Yum, definitely trying this. It feels so good to see buds on the trees and flowers beginning to bloom! Cauliflower, chick peas, and curry sound so good! My go-to light meal is salad, but I need to switch it up with this tasty meatless meal. Enjoy your warm-ish weather, Dawn! This is my kind of dinner! I’m not sure if I’ve mentioned how much I love curries but I LOVE them! And chickpeas are always a winner with me. Just pass the naan and I’m set. Have a great week, Dawn! Mine too Kelsie!! We eat them on the regular around here 🙂 Thanks so much! Have a great week too! Three of my favorite things Dawn…chickpeas, curry and cauliflower! I’ll be making this for sure! Pinned! Woo hoo! Happy to hear that, Mary Ann! Thanks so much! It finally is starting to feel like Spring around here, too! (Well, to be fair, it will tomorrow. Today is very cold and rainy. But it takes rain to make the plants grow, right?) And this is a really fun recipe to serve on these early Spring days. I always enjoy cauliflower, but I never think to buy it at the store. This version looks fantastic, and I definitely need to work this one into the dinner rotation soon. Thanks for the curry tips! I will definitely go for this curry with naan! Or stuff a pita pocket with it, OMG, getting to excited. The essence of what I love about curries here…This chickpeas fan is pinning and making this recipe!! Have a great day and week, Dawn!